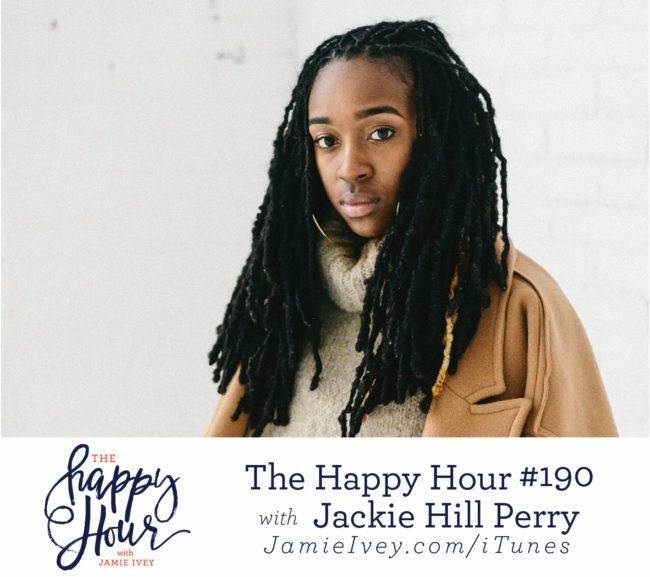 My guest for The Happy Hour # 190 is Jackie Hill Perry. Jackie is a writer and artist whose work has been featured on such publications as the Washington Times and The 700 Club. Since being saved from a lifestyle of homosexuality, she has been compelled to use her speaking and teaching gifts to share the light of the gospel of God as authentically as she can. She is signed to Humble Beast Records and released her debut album, The Art of Joy, in 2014. At home, she is a wife to Preston and Mommy to Eden. For two years I've been working on getting Jackie on the show, and I am so excited to share our conversation with you today. On today's episode we cover some challenging topics: racial issues and homosexuality. I know these topics can bring us into uncomfortable or tense spaces, but I believe talking about hard issues is valuable and important, and my hope is that we can all be listeners and learners in these spaces. Jackie and I begin the show talking about gospel diversity and the power of indifference. She describes how we can gain knowledge about the issues, but not take that knowledge and change how we live out our lives. The perspective she gives about the impact of indifference and inaction is powerful. In the second half of the show, Jackie shares her story of how she was living a life of homosexuality and how God pursued her and saved her in a way only God could. You are going to love hearing her talk about how her public ministry began just FIVE months after she decided to follow Jesus - her first public testimony was all because she wanted a free t-shirt! You guys, Jackie is bold and she speaks some powerful truths. When I asked her if she was afraid to fail, she said "Either I trust God or I don't... If I fall, then I fall and I get up and trust God some more". What Jackie is loving: oranges!